And we have a map!!! After about one month of preparation I have amassed sufficient information to create a basic route map of Lusaka’s public transport network. In this post I will describe some of the key elements of the map and identify the ways I see the map being useful to riders. The city-wide perspective granted by this map is primarily due to information provided by the Zambia Institute for Policy Analysis & Research (ZIPAR). As part of their research to inform this policy brief, ZIPAR investigators used GPS units to monitor the movements of a number of minibuses. The analysis of that data was a chore that would merit its own blog post, but one conclusion was the identification of heavily traveled pathways, many of which resemble the likely pathways for the route names that we are accustomed to hearing the call boys shout at the stations and stops around Lusaka. I have combined this information from ZIPAR with that of my own riding experience to create the map. There are some limitations to the ZIPAR findings, such as only noting those routes that originate or terminate in Town, and identifying routes according to the frequency of travel along given lines without having a way to note the route names that the operators were communicating at the time. The effect is that there could be important routes that are not included here, or an inconsistency between the name that we have posted on the map and the actual pathway followed by the vehicles that claim to be operating on that route. These are problems that can be addressed through feedback from riders. I created this map using “the new” GoogleMaps. This version has an important upgrade over what is now called Classic GoogleMaps: the possibility of creating layers. In my previous attempts to map the network I was frustrated by my desire to present various types of information without being able to highlight the most useful elements while making other information optional. With the allowance of at least three layers I was able to add additional levels of detail that should only appear when readers want them, while leaving the map of base routes as most prominent. Blog readers presented a compelling case as to why I should use OpenStreetMap as the mapping platform. Despite studying the mapping process for hours I was not able to make that route that I had mapped appear on the “Transit layer” of the Lusaka OpenStreetMap or the public transport focused derivative OpenBusMap. In the absence of further technical guidance I will therefore not be using this platform. I made a brief attempt to map using GeoCommons but quickly aborted that mission when I realized that I could not easily figure it out through self-teaching. This is intended to be information that is broadly useful to many riders and should be the most prominently visible. The base routes that I have identified here are the ones that I am confident operate at a high frequency throughout the day, every day. Almost all of these routes service Town and in most cases operate from more than one of the four terminals there. In these cases the route is named exclusively by its outer terminus. In the instances that a route does not service Town – for example, the route running between Mutendere and the University Teaching Hospital (UTH) – the route name includes both of the common extremities and a directional arrow made using standard characters. The example above is thus “Mutendere Hospital,” with the arrow indicating that the route runs in both directions. My daily travels usually include trips on routes that are not among the base routes mentioned above. These are routes that do not run frequently, or all day, or every day. Keeping these routes separate from the base routes leaves that map less cluttered and user-friendly, yet showing these lesser-known routes is of great value on a map since by definition there are fewer people who can provide information about them. In principle secondary routes are those for which there is often service, but it is not frequently available at all times. Limited service routes are those that are available only at very specific times. Secondary and limited service routes are distinguished by line thickness; with secondary routes thicker than limited service ones. Both of these are indicated by lines that are thinner than those used for the base routes. At this stage I have only marked a few secondary and limited service routes that I am familiar with, primarily to see the effect on the map. I like it, and if the feedback remains positive I will continue to add to this visual directory of lesser-known routes. For a rider who is planning a trip on an unfamiliar with a route, it is information on the stops that are most valuable. The main difficulty of mapping the stops, however, is their number: it would be extremely difficult to identify them all, and if someone did this the map would be overwhelmed by that information. At this stage I have simply identified a few stops that I am familiar with as an experiment to see how this layer could work. I will likely pursue, abandon, or modify this effort based on feedback. 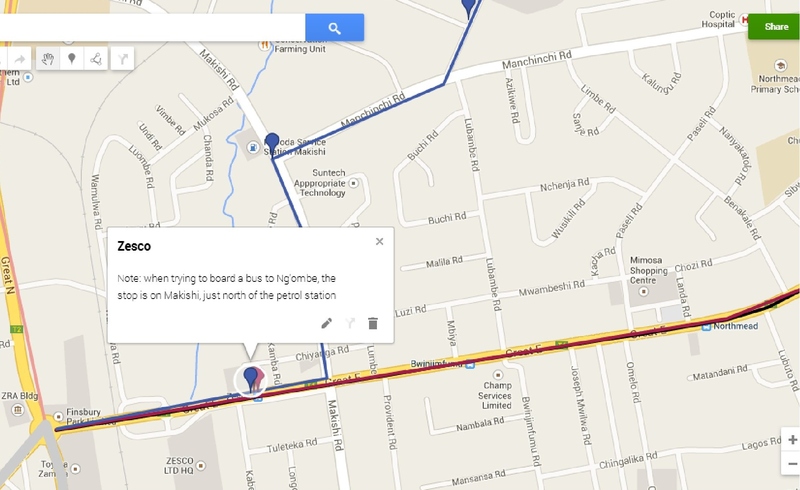 I should note that GoogleMaps already has some public transport stops on its base map of Lusaka. In some rare cases (such as on Great East Road), the stops are accurately placed, named, and comprehensive for the routes that use them. The vast majority of stops are not indicated, those that are indicated are often unnamed or misnamed, and no stop is linked to route information that would indicate where someone could possibly travel from that point. Unfortunately, on its own this map does not suffice as a riders’ guide for the uninitiated. As presented, this map takes for granted that someone viewing it is comfortable with the logic of a decentralized network that is micro-managed by independent operators. This logic has direct implications on the seemingly erratic fare structure, vehicle speed and routing (including deviations decided en route), and the pattern of vehicles sitting immobile and mostly empty at some stops, before then blowing through other stops with a full load of passengers. Regular riders in Lusaka – or in cities with similar systems – are so accustomed with the above logic that my writing it down would be completely uninteresting to them. By contrast, those unfamiliar with this logic would be overwhelmed by the amount of explanation required to make it explicit. I am willing to pursue the exercise of developing this type of explanation (or finding one and linking to it) if there are requests from readers for it. Otherwise I shall continue to focus on building and modifying the map according to the information that I know but have yet to add, and the feedback that I receive. I would love some explanation regarding negotiations with the call-boys – or at least some idea of costs. Sometimes it’s 3-5K, but when should we negotiate? and when shouldn’t we? The answer to this could be very long or very short…having spent LOTS of time thinking about this, I’ll do my best to provide a short one here. You can try and negotiate at any time prior to boarding a vehicle, but the situation will determine how much leverage you have. You might also want to determine how much energy you are willing to expend for 1-2K, vs the minor sense of shame you feel knowing that you paid a “mutengo wa muzungu” (white man’s price). Some trips have fares that are very standardized and you will see little variation (for example, if you board at a station in town and ride right until the end) whereas others can vary greatly depending upon how much of a rush the drivers/conductors are in and how likely they are to find people who will pay more than you. If you’re ever interested I can offer examples of rides that I can normally barter down and others where the bus just left me standing at the curb with my insistent low-ball offer. Once you are on the bus and moving you have little leverage and the only available “negotiation” occurs when you are clearly being ripped off or stiffed for change. Do note that the call-boys (the ones who hang around stops and try to steer you towards certain vehicles) are different from the conductors (the ones who actually ride in the buses). I have been in heated situations before where I negotiated a price with one guy only to see him walk away and leave me in a fight with the conductor who returned a moment later. Since it’s difficult to tell who’s who when you arrive and the call-boys have ample incentive to mislead you on their role I have no sure-fire way to avoid that situation. Thanks for the response. Definitely has helped, I’ll just use my limited Bemba (inshinga) to try to limit my mzungu status and hope for a better price. Is there a cap for minibus costs (ie if I’m taking the longest trip possible, how much do I expect to pay?)? For the typical routes that come-go from town, the most I ever paid (as did all the other riders) in 2014 was 6K for a ride to Chilanga, but that is a lesser-used route that effectively extends beyond the city limits. On the heavily used Chelston-Avondale and Mutendere routes I believe the maximum fare is 5K or 5.5K. One exception to watch for is “short-cut routes” for example those leaving UTH in the afternoon rush hour. 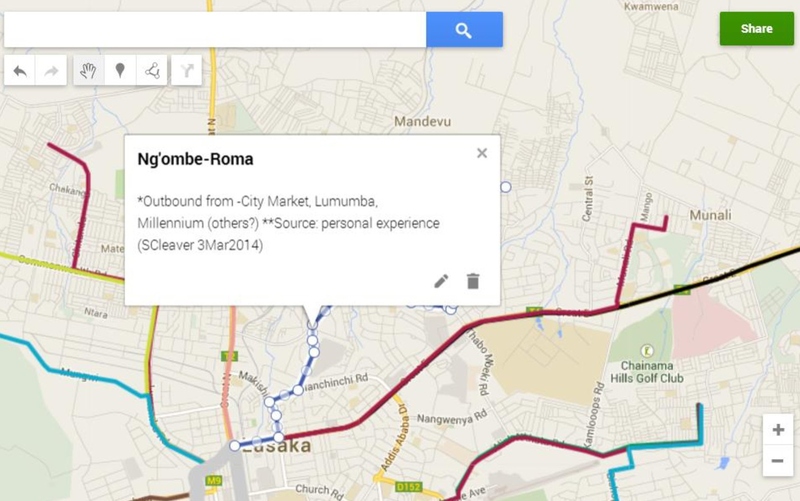 On that route I would pay 7K to Ng’ombe-Roma; less than the cost of riding into and then out of town. Hi. Great work you’re doing here. I’m doing research on development of public transport in Lusaka and Zambia as a whole. It looks like we have a mutual interest. Firstly, I would like to ask your permission to use some info from your route map for my thesis. Thanks for that compliment! The map info is in the public domain, so no need to ask for permission (that goes for all of you other budding researchers out there…), but thank you for asking. You might have also seen the links to a Masters thesis from UNZA on the colonial era development of buses in Lusaka – I thought it was excellent work that helped me to understand the spatial arrangement of the city. I look forward to seeing your research as it moves forward!